Hans Christian van Nijkerk (b.1982, Amsterdam, the Netherlands) is a performance artist, visual artist and musician who lives in Bergen, Norway. After a successful career as middle-distance runner and years of gaining stage experience through music performances, he studied at the Tromsø Academy of Contemporary Art. In his performances, he inhabits a variety of stage personas ranging from energetic and charismatic motivational speakers to more introverted eccentrics. Both serious and playful, he toys with the audience. Voluntarily or involuntarily they become test subjects for his social experiments through their predictable or unpredictable reactions (or lack thereof), following or disobeying instructions and games. His more recent video works use elements of the documentary genre, while experimenting with storytelling, self-staging and sound. Since 2015, Hans Christian has shown his work in 6 other countries. He has organized performance art events and exhibitions as a member of Performance Art Bergen and BLOKK and has received grants from Arts Council Norway (2013 and 2018) and working grant from Billedkunstnernes Vederlagsfond (2016-2018). Duration: 40 minutes on August 17 and 60 minutes on August 18. At music festivals people often act more freely – more relaxed than in other daily life situations. With the performance «Expressive Herd», Bergen-based performance artist Hans Christian van Nijkerk (NO / NL) mirrors this behavior with methods meant to make the audience more aware of their own way of behaving. To increase the absurdity, the actions in this artistic social experiment are removed from their usual context or be «wrong» in some way. All photos by Sommerøya festival photographer Morteza Masuleh. Produced at BLOKK and Nida Art Colony. With reflections and stories by Pål Gusdal Jomås, Eva Eich and Hiroko Tsuchimoto. The work displays motifs from the World Cycling Championship held in Bergen in september 2017. On top of the images we can hear 3 different persons - all with some connection to Bergen, but none of them locals - talk about their relationship to Bergen and in this way an outsider's portrait of the city is drawn. You are hereby invited to an international dinner party. No matter what your background or criminal record is, we -Hans Christian and Hiroko- want you to feel welcome. This will be a non-hierarchical, trigger-free safezone. We will be preparing handmade ethical food for everyone. If you have any allergies, please notify us in advance. We will be also serving non-alcoholic drinks. You can bring your own alcohol, but please be mindful that some people might have traumatic experiences related to alcohol. When eating, eat with your mouth closed and do not talk simultaneously. Please be aware that highly sensitive guests cannot handle the sound of chewing. Please try to include all guests in your conversations, while at the same time show understanding if someone does not want to talk. People on the more introverted scale grow tired of too much socializing. Please be aware of how much you are talking. Listening is equally important. To keep you entertained, we will involve all of you in a non-offensive game for the whole family. Fun times! Feel free to take photos or video clips at the dinner party. You can rest assured that documentation will not be used against you. You can share this invitation with your close friends, partners or significant others. Please respond and lighten our hearts! Dinner Party! 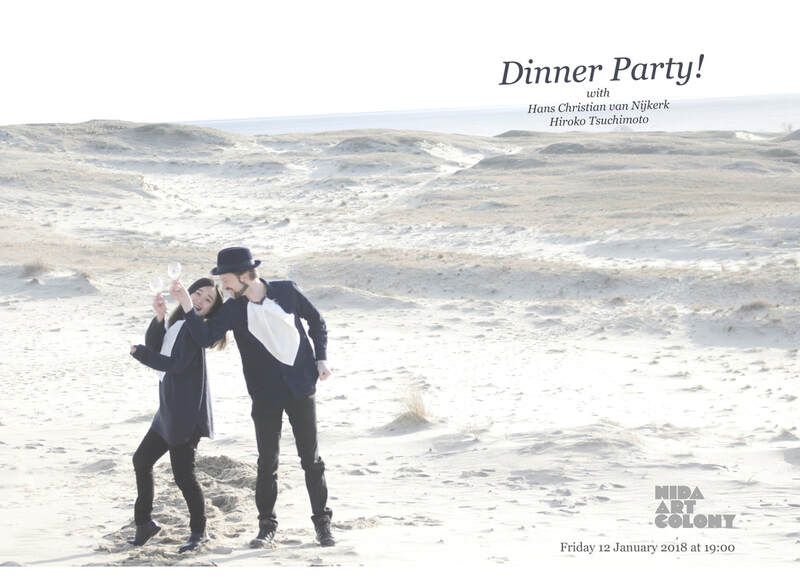 is a collaborative project with Hans Christian van Nijkerk and Hiroko Tsuchimoto in Nida Art Colony, located on a peninsula between the Curonian Lagoon and the Baltic Sea. They used the context of Artist in Residence and invited international artists to an occasion of a dinner party. They committed to entertain all the guests with welcome gestures, nature-inspired rustic table setting, handmade fusion cuisine, scripted small-talk which addressed ethics and political correctness in intercultural communication. They also gave a GoPro camera to the guests to keep them occupied. Site-specific installation with Hiroko Tsuchimoto at Nida Art Colony, Nida, Lithuania. "Beware!" is a site-specific installation at Nida Art Colony. The work encompasses a range of red warning sign stickers, stuck on public walls and floors at strategic locations in the building. The warnings themselves, viewed individually, would for the most part not be out of place in a public building where security is a priority. But seen altogether, they convey an infantilizing, paranoid and over-protective view of the people frequenting the building and point to a society obsessed with security at all costs.